Want to freak out that uncle you have that’s always telling you war stories from when he was in Vietnam? Let him wake up to this alarm clock from Toyo Trading. 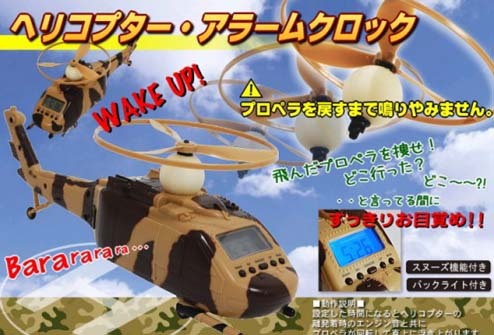 Like other unique alarm clocks from Japan, this one will shoot off its spinning propeller, and bombards the sleeping victim with noises of helicopters in flight. In order to turn it off, the war-torn individual has to locate the top and stick it back on top of the helicopter. The helicopter blades are actually a top, so when it lands, it can continue traveling on the floor. This can be yours for a mere $35.